IFTTT, an abbreviation for If This Then That, connects various web services together using conditional statements that trigger particular actions. In basic terms, if one web service does one thing, another web service does another thing. It’s not just another RSS scraper either. It has extensive features even under the free account and provides numerous opportunities to wisely use automated actions to leverage your time. When I publish new blog posts, I don’t want to have to manually post the link to Facebook, Twitter and LinkedIn. I want an RSS aggregator to scrape my blog feed, detect the new blog post and share it on social media. I do use TwitterFeed already but the Facebook sharing functionality of that is limited so I wanted another tool to take over. I first tried IFTTT when Facebook updated its API and put RSS Graffiti out of business permanently. For years I’d been using RSS Grafitti to post my blogs to Facebook prior to the changes. IFTTT picked up the slack. 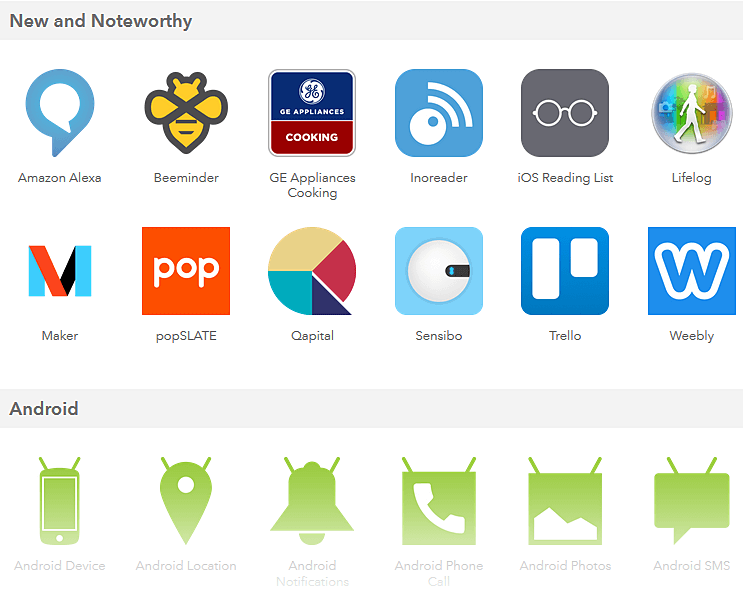 Of course, there are tons of ways to use IFTTT with all the new web based services being added. It’s kind of like a more user friendly version of Yahoo Pipes which, incidentally, is being discontinued September 30th 2015. There are some cool ways to use IFTTT with LinkedIn, if you’re a job seeker. Channels are the basic building blocks and are represent the data input and output of the various web services such as YouTube, eBay, RSS, SMS and hundreds more like these. There are particular triggers and actions for each channel. The applets of IFTTT are the equations/formulas that drive the automation triggers preceding the actions. I mentioned a moment ago how when a new post is published in a website RSS feed, Twitter will publish a new update for you containing the title and link (or whatever the recipe is that you set up). Users generate their own applets and publish them on the site. By default these new applets are emailed to you every day. These can be useful and may give you some good ideas. Let’s again use the example of aggregating a blog post from your RSS feed to a social media channel. Using content meta data, or “ingredients”, you can selectively include/exclude different parts of a website post, including featured image, title, description, author name, publish date etc. With the Twitter “recipe” I added the prefix “Latest Post” so this will appear in front of the title of the new post when it appears on my Twitter timeline. Triggers are the “this” part of a recipe. They are the items that “trigger” the action. 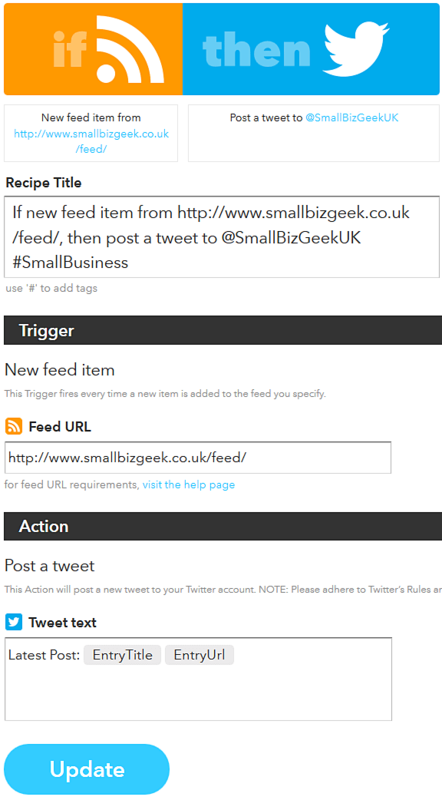 For example, from an RSS feed, you can receive a notification based on a keyword or phrase. Actions are the “that” part of a recipe. They are the output that results from the input of the trigger. Ingredients are basic data made available from a trigger. For example, that data that are available from the email trigger include subject, body, attachment, received date, and the sender’s address. 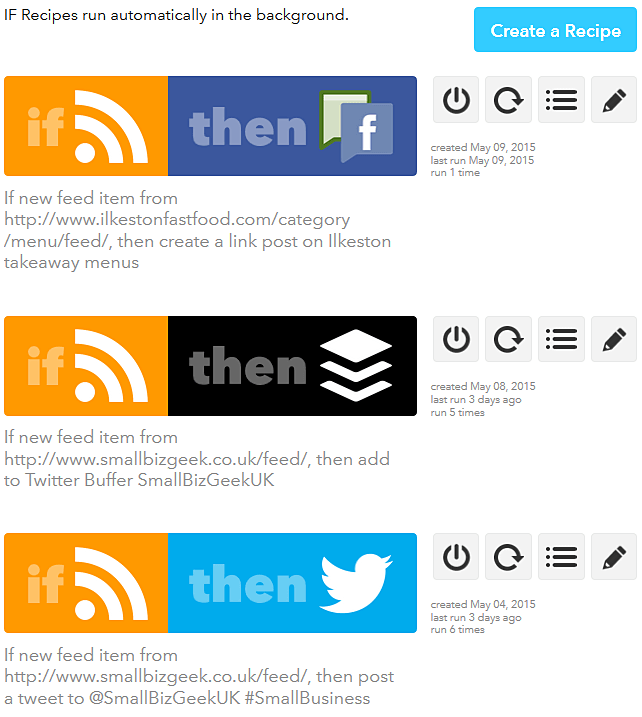 I recommend you use IFTTT if you’re trying to free up some of your time in posting new content to your social channels. When I create new blog posts, for example, I like the links to go out on Twitter at least 4 times on the day of publication. You can do that if you create enough applets. This is a fremium tool. The free account is pretty good but there are limitations, such as only being able to connect one facebook page per account. The solution is to create separate/multiple free accounts if you really need to push content to more than one Facebook page. In closing, I’d like to warn you by saying the social networks frequently update their usage policies and change their API. This means ingredients from some of the channels used in applets can stop working at any time, so monitor them. One of the things that bugs me about the RSS to Facebook posts I was talking about earlier is that the meta description of the post is never pulled in to the Facebook status. I hope IFTTT can deal with that in the future.